For starters, I no longer do any video editing. This, as readers may know, requires massive amounts of storage space, high-end specs, and specialized software. Secondly, Chromebooks have evolved and now offer support for Android and Linux apps. That would give me access to an array of apps from messengers I use to keep in contact with friends to photo editors making the switch seem more feasible. Recently, I had the chance to review the HP Chromebook X2, a beautiful and very capable machine. With that my experiment began to see if I could break free from my reliance on Windows computers. It was a bit of a rocky start. As a lifelong Firefox user I had hoped I could make the switch and use the Android or Linux app. Unfortunately, the Android app didn’t offer enough options and the Linux app froze under heavy loads. This was the first time but certainly not the last that I would be disappointed by Android and Linux apps on Chrome OS. After transferring over to the Chrome browser, syncing all my bookmarks, and installing all of my usual extensions I was ready to move forward, only to hit another snag. As a writer, I often have many tabs in the browser open doing research, and on a Chromebook it likes to dump unfocused tabs out of memory. Which means clicking back and forth on many tabs requires the page to refresh. Even with a fast internet connection, this causes a lot of time waiting and sometimes losing your place on a page once it refreshes. Thankfully, I was able to find a way to change this behavior but it was quite frustrating until I looked it up. As a Windows user, I’m accustomed to using dedicated apps for most of my computing. And, as an Android user, I love the variety of apps available to us. Using a Chromebook taught me to rely more on web apps or portals than Android or Linux apps. This is mostly due to the fact that Android and Linux app support is a mess on Chromebooks. While I would have preferred to use the dedicated Android app for many tasks, most were too unstable to be usable. Instead, I was forced to use the Chrome app or website portal if available. Chrome apps and web portals are often functional but not as convenient to use when multitasking, in my experience. For example, I use several different chatting services and I like to keep these separated out from my web browsing to quickly jump back and forth. This is certainly possible on a Chromebook albeit with a little more effort and using a mix of Chrome apps, web portals, and Android apps. Overall though, it gets messy and the experience is inconsistent. For a chronic multitasker like myself, this mix of apps and inconsistency made me less productive. Besides the inconsistencies, there were other, more serious, issues. When it came to video file playback the built-in video player didn’t support AC3 sound. No problem I thought, I’ll just use VLC. However, the VLC Android app refused to play the voice channel, and unfortunately, Linux in Chrome OS doesn’t support sound. I was eventually able to get it to work with MX Player with an external decoder. Not my preferred method but it worked. Another issue I ran into was my favorite Reddit app wouldn’t work and I was forced to find an alternative. Hangouts is one of my favorite apps but it froze intermittently while attempting to use it. Then there were other chatting apps which didn’t recognize the enter button, alt+enter, or ctrl+enter and required pressing the send button manually each time. Even on apps that did work, the DPI was often set to a level which made text too small to read comfortably with no option to change it. When I gave gaming a try I ran into an issue where the shelf wouldn’t hide during Mortal Kombat X. This made buttons in the game lower than they appeared on the screen, forcing me to tap below the actual button in order to make it work. Linux apps were more stable in my testing but I also ran into issues here. I often need to edit photos, whether for work or simply for fun. Without access to Photoshop, I had to use Gimp, which is a capable editor but not the most user-friendly or convenient to use. Using it on a Chromebook adds another hurdle. Despite having a microSD card slot for expandable storage Linux apps cannot access it. Instead, you are forced to copy files to the Linux partition or else you cannot open them with Linux apps. This poses a problem on a machine with only 32GB of internal storage. It also makes file management very disorganized. When I began this experiment I was optimistic that, between Android and Linux app support, a Chromebook would be able to replace my Windows laptop. In reality, the Chromebook was actually able to replace my Windows laptop. I was able to go a few days without even opening my previous Windows laptop and accomplish everything I needed. The problem is, even though I didn’t need to open my Windows laptop, I wanted to. What I had hoped would be a smooth transition often turned into me jumping through hoops just to make things work. Buggy apps left me frustrated and I felt I was constantly compromising in order to make the Chromebook achieve the tasks I needed. This was annoying, and the extra time needed to accomplish tasks made me unproductive. 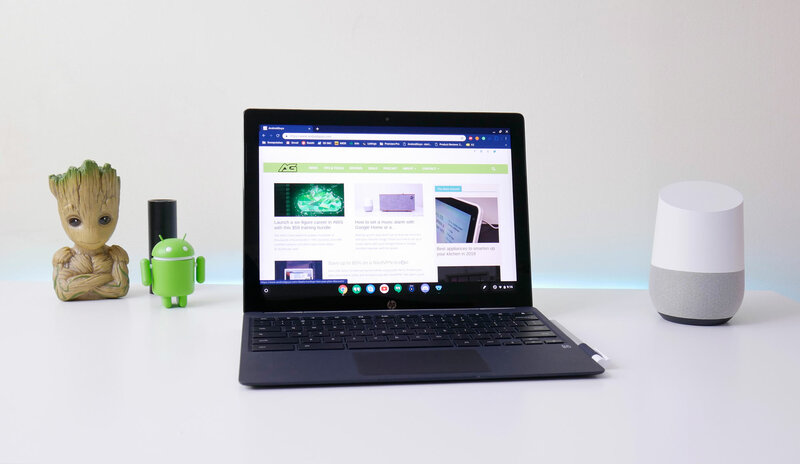 The HP Chromebook X2 is a great Chromebook and Chrome OS can certainly work for some people. However, having a consistent experience with access to superior apps such as Photoshop makes me more productive and ensures I’ll stay a Windows user, for now.